The iPhone 'Clock' application can be made run on iPad (for the most part) and it scales up pretty well. It runs perfectly fine in the SDK sandbox and it also is capable of setting system alarms (and the alarms can run in the background, as you do on your phone). Naturally this is pretty useful, as I don't believe there is any way to set wake-up alarms on iPad right now without this. 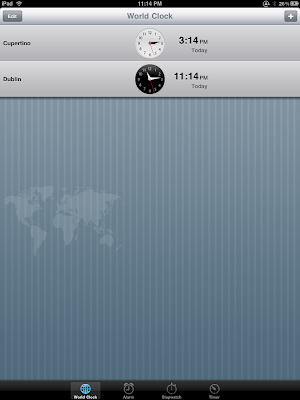 Considering I'm using iPad for everything now, I think an alarm ability might be of use! You'll notice that it only runs in portait mode, which is a bummer. I'm sure you could fix this with some clever editing of the binary but I can't be bothered. The Timer tab doesn't quite work at all, so pretend it doesn't exist. You'll most likely also want to provide your own Default.png images or you'll have a horrible blurry splash screen. The alarm time picker will refuse to show unless you omit step 2. Omitting step 2 makes the app run as an iPhone app (i.e. not fullscreen) but enables all functionality across all tabs. However, alarms you set in mini-mode will persist so if you need to you can pre-set all your alarms beforehand in that mode, and in the big mode only enable the alarms when you need them. Make sense?